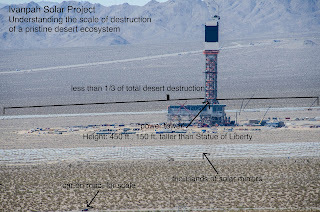 BrightSource Energy recently submitted another petition to change conditions of certification set forth by the California Energy Commission (CEC)--which spell out what steps the company must take to make up for ecological damage caused by the company's Ivanpah Solar project. 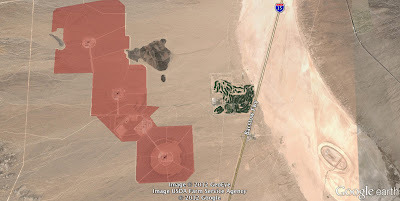 This time BrightSource is seeking to take advantage of a desert habitat conservation program administered by the California Department of Fish and Game, probably because the company is unable to secure quality desert tortoise habitat in the Ivanpah Valley area. 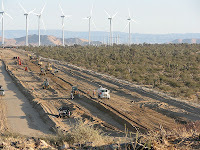 In its petition to the CEC, BrightSource Energy argues that conserving habitat in the Ivanpah Valley is not worthwhile because human development has limited the value of the area to serve as desert tortoise connectivity. BrightSource, however, has a record that disqualifies it from making authoritative statements on wildlife issues. A prickly poppy in bloom in the central Mojave Desert. Plenty of spikes, but a beautiful sight, nonetheless. A fellow climate change activist -- who goes by "RLMiller" on the Twitter -- recently nominated a Los Angeles Times reporter as the "most anti-solar reporter in the mainstream media" in a blog post on the Daily Kos (RLMiller previously levied this criticism against a more deserving recipient -- Fox News). 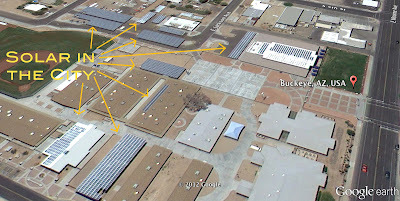 The offending reporter, Julie Cart, published an article on how industrial-scale solar facilities built dozens of miles from the nearest county services, impose a financial burden on local governments. Not only do the counties need to deploy new resources to emergencies (fire, police, medical) where they do not normally occur, they also have to accommodate heavy construction traffic on crumbling roads, increased water consumption where water is scarce, and then tell longtime taxpayers, voters, and residents that they have to put up with a giant, Wall Street-backed industrial behemoth next door that does not conform to the county's original zoning rules. The Arizona Corporation Commission (ACC) -- the body responsible for rate adjustments for utility companies in Arizona -- was presented a report by its staff last month that recommended a paradigm shift in how it meets its renewable energy goal of 15% by 2025. The ACC staff report recommends that Arizona meet its renewable energy needs with stepped-up investment in rooftop solar, which the ACC staff judges to be the lowest cost renewable energy option because distributed generation does not require expensive new transmission lines and centralized power plants. The recognition of rooftop solar's value is a positive sign for our southwestern deserts, which are threatened by both climate change and industrial sprawl from large-scale solar and wind facilities. 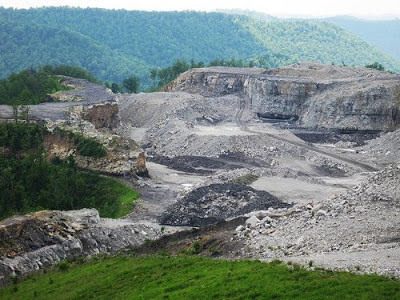 Patriot coal announced this week that it was stepping away from mountaintop removal in Appalachia. Although a far distance from America's southwestern deserts, industrial-scale energy development is a familiar threat to conservationists whether you live in West Virginia or California. I wrote last week about Utah-based Goal Zero's efforts to bring solar power chargers to victims of Hurricane Sandy, giving folks the ability to run essential appliances and lights as they wait for utility companies to rebuild a vast and vulnerable electricity grid. The company has a "one for one" relief effort. For every solar device purchased through its online store or participating retailers (including Amazon), they will donate a kit to Sandy relief victims. As of late last week, the company had already lined up about 2,500 donated kits for victims of Sandy. After 11 September 2001 the country recognized an urgent threat to its security. The debate prompted by this tragic event is still relevant even after three Presidential elections and eleven years -- how much of our civil liberty do we sacrifice to mitigate this threat? Military tribunals, library records, torture, and transparency. We are still questioning compromises of justice and privacy for the end state of security. This debate will last for centuries, much like the threat. The election is over. It's time for our country's leaders to implement a real energy policy that generates clean power through rooftop solar, or other renewable energy facilities on already-disturbed lands. The "all of the above" policy endorsed by the previous two Presidents has not been successful in combating climate change or protecting our wildlands, as we have seen with the landscape destruction wrought by fossil fuels and industrial-scale wind and solar. We have a serious opportunity to revolutionize the way we use and generate energy -- we can make our homes and businesses more energy efficient, while using the untapped space in our cities for solar panels. Goal Zero, a company that sells portable solar chargers for household electronic devices, has jumped into the Hurricane Sandy recovery efforts, driving a Penske rental van full of their products to New Jersey and New York to provide solar power to relief centers and citizens in need. While utility companies are struggling to untangle the mess of substations and downed transmission lines in the wake of Hurricane Sandy, thousands of people are left without the energy we have taken for granted to run everything from our cell phones to medical devices. One thing is for sure, even without the more frequent weather extremes brought on by climate change (which Hurricane Sandy may, or may not be a result of...see Andy Revkin's post), we need to create a cleaner, and more resilient energy supply.